It’s time to clean up your lawn for spring! Spring is the perfect time of year to clean up your yard. As you’re beginning to let more fresh air into your home, you’re also probably thinking of ways to freshen up your garden and bring your plants back to life. Bring out your rake, trowel, shovels, forks, and spades, and remember these tips for all your outdoor spring cleanups. For gardeners that have established plant beds that you’ve used in previous years, start your spring cleanup routine by adding some fertilizer around your plants and plant beds. If you see any weeds, you should also take this time to pull those before they get the chance to grow even bigger as the weather continues to get warmer. For those who are creating new plant beds, invest in a tiller to help you break up the new ground. Build raised beds and use the smother method to kill the grass in your planting space. Early spring is the best time of year to start planting, especially trees, shrubs, and perennial flowers. You should also take this time to overseed your lawn or start a new lawn to help encourage lush growth. All your hard work will be worthless if you can’t get the problem of pests under control. 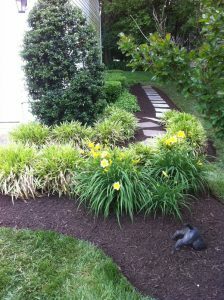 Use landscape fabric and mulch to cut down on weeds in your flower beds. It may also be beneficial to use a pre-emergent herbicide to guard against the ever-annoying issue of crabgrass. Continue your spring lawn cleanup by thinning out crowded flower beds and cutting back those elements that have been damaged by winter. Make sure that the soil has sufficiently thawed before digging up any daylilies or hostas. Divide those areas to the point where you’re leaving three stems in each clump. When it comes to climbers, keep the younger green canes while carefully removing the older, woody canes. If necessary, a great tip is to use jute twine or gentle Velcro fasteners to hold the canes in place. As you’re cleaning up your lawn and preparing your garden for the spring and summer months, don’t just toss all that yard waste away. Use it to build a compost pile or fill your compost bin. Use collected leaves, cuttings, old mulch, and foliage along with food waste from your kitchen. This entry was posted on Thursday, March 15th, 2018 at 4:21 pm. Both comments and pings are currently closed.